Alexander the Great was the first to establish Greek cities in Afghanistan. After his death they fell to the Seleucid Empire of Greek Syria, before finally breaking free. The land that now belongs to modern Afghanistan has served many foreign masters since entering the field of history as ancient Bactria. It was absorbed by the Persians, invaded by Alexander the Great, settled by Greeks, and eventually, in the mid-3rd century BCE, made into its own kingdom and ruled by those invading Greeks. Despite a prominent position on the Silk Road, the early history of Afghanistan is shrouded in mystery and myth. The ancient Greeks reckoned that it was the birthplace of not only Zarathustra, the great prophet of Persian religion, but also the entire art of magic. The Bactrians themselves, it was said, were related to the Amazons, a mythical nation of feared warrior women. In reality it was a rich and fertile land with many urban centres, which used its perfect position on the trade routes to export its great surplus of rice. No one quite knows how or when, but before the end of the 6th century BCE Persian interest in those riches lead to conquest. As a Persian province, Bactria was known for its highly equipped cavalry. That is how Alexander the Great first came into contact with the Bactrians while campaigning in Persia. 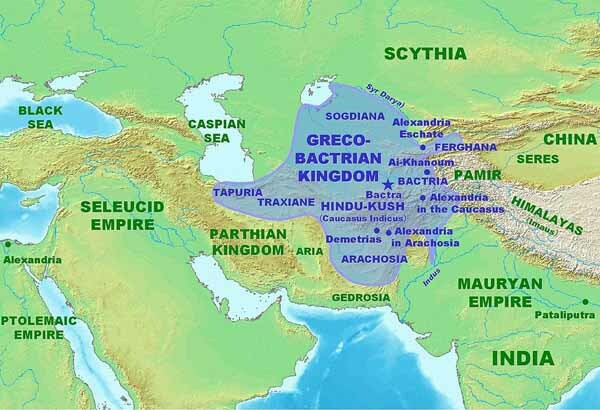 Bactria came to Alexander’s attention in 330 BCE when, having aided in the old king’s murder, the governor of Bactria pronounced himself the new king of Persia. Alexander and his army arrived in Bactria hungry and worn thin, having suffered great losses of men and beast alike crossing the treacherous Hindukush mountains. In their shape the Greeks might not have been able to take Bactria by force, but they did not have to. The capital city of Bactra (modern Balkh) opened its gates and handed over their governor. It was not a invasion entirely without bloodshed, however. Some Bactrians later revolted against Greek rule and were consequently killed or enslaved. Alexander then shocked everyone by marrying a Bactrian noblewoman, before continuing his conquests into India. Alexander died soon thereafter and a struggle for power over his vast empire ensued. For several years the future of Bactria was uncertain. When the dust of revolt settled in 312 BCE, Bactria was part of the Hellenistic empire belonging to one of Alexander’s generals by the name of Seleucus. Though part of the Seleucid Empire, Bactria experienced some degree of sovereignty with its own governor and it had a strong economy of its own, even minting local coins. Part of the reason for Bactria’s unusual freedom was its frontier-like situation. There was a constant threat of invasion by the northern tribes, so in order to keep the buffer zone stable it was appeased with unusually gentle handling. As more cities were founded, the Greek population of Bactria grew. Waves of immigration from the Mediterranean filled the new urban centres, which closely resembled those of Greece proper. Though a frontier, Afghanistan was not wilderness. The strong local economy of Bactria eventually allowed a local governor, Diodotus, to take the power of rule. He proclaimed himself king of Bactria circa 250 BCE, though it is uncertain if he did so by buying himself an army of revolutionaries or by simply controlling enough wealth that the descendents of Seleucus did not wish to anger him by protesting. Out of unstable conditions and the ambitions of powerful men emerged thus the Greco-Bactrian Kingdom. And in that state of flux the kingdom remained for its entire century of existence. Holt, F.L., Thundering Zeus: the making of Hellenistic Bactria, Berkeley 1999. Sidky, H., The Greek kingdom of Bactria: from Alexander to Eurcratides the Great, Lanham 2000. Tarn, W.W., The Greeks in Bactria and India, New Delhi, 1938.